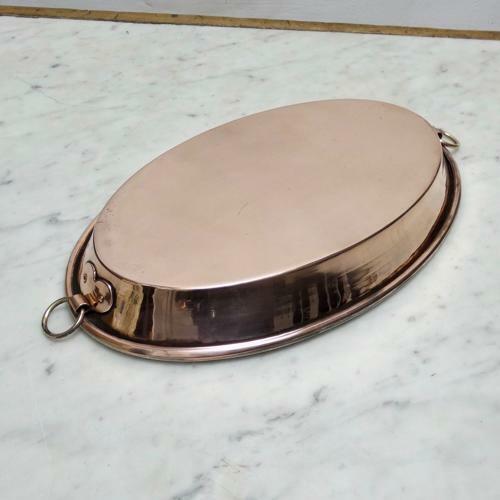 A 19th century, oval copper gratin dish. This piece is French and it dates from c.1890. It is made from a substantial gauge of copper and it has folding, brass, loop handles to both ends. These are attached by heart shaped copper fittings. There is very minor scratching to the copper, on the base of the pan, from use, but otherwise it is in very good condition. The interior has been re-tinned so that it can be used. These dishes are ideal for cooking and then taking the contents straight to the table.